Congratulations to Heather Dutton of hang tight studio! Her Fleur de Cuillère won out over an inspiring field of entrants in our Spoons-and-Flowers-themed fabric design contest. 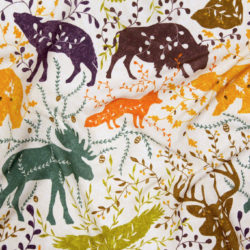 One of the cool things about the Spoonflower community, as most of you know, is how many amazingly talented amateurs use our site to create fabric and try out ideas. 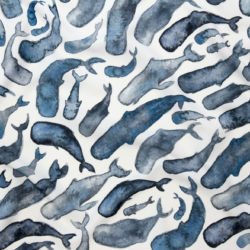 Anyone who can put together a digital design can create fabric using Spoonflower, and many of the efforts we see — even from people trying this for the first time — are really fun and creative. 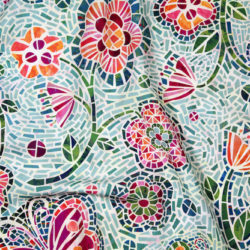 [Anyone remember Kim's flower and bees fabric? It was her first effort at creating digital art.] But in my mind what makes our community even more cool is that we also have professional textile designers mixing it up elbow-to-elbow with the amateurs. I mention this because in glancing at Heather Dutton's web site, it appears that she is a professional who also does this sort of thing for companies like Pottery Barn and Starbucks as well as for fun. It makes me happy to see designers of many experience levels inspiring and sharing with one another. 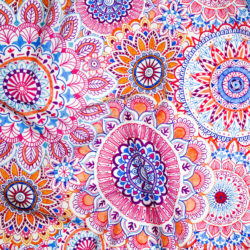 At any rate, you can buy Heather's Fleur de Cuillère fabric for the next six days only from our Etsy shop. And thanks to all seventy of the designers who participated in this theme! You all rock. Well, I am new here and am not real sure of what I am doing BUT I would like to know if you also print on PAPER?? I was thinking gift wrap paper…. I was looking for a place to print on paper when I found Spoonflower. Actually fabric might be cooler but who knows?? ?